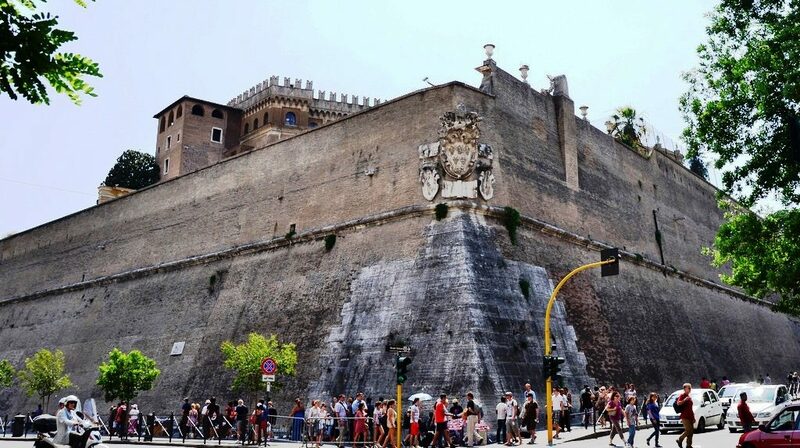 Portion of wall built in 9th century to defend Vatican City from Islamic raids. “I appeal not to create walls but to build bridges” has long been Pope Francis’s mantra. The grand irony of all this is that Pope Francis lives in the only state to be surrounded by walls—Vatican City—and most of these bastions were erected to ward off ongoing Islamic invasions. Most notably, in 846, a Muslim fleet from North Africa consisting of 73 ships and 11,000 Muslims, landed in Ostia near Rome. Muslim merchants who frequently visited Italy had provided them with precise intelligence that made the raid a success. Although they were unable to breach the preexisting walls of the Eternal City, they sacked and despoiled the surrounding countryside, including—to the consternation of Christendom—the venerated and centuries-old basilicas of St. Peter and St. Paul. The Muslim invaders desecrated the tombs of the revered apostles and stripped them of all their treasures. Pope Leo IV (847-855) responded by building many more walls, including fifteen bastions along the right bank of the Tiber River, the mouth of which was forthwith closed with a chain to protect the sacred sites from further Muslim raids and desecrations. Completed by 852, the walls were in places 40 feet high and 12 feet thick. Further anticipating the crusades against Islam by over two centuries—and thus showing how they were a long time coming—Pope Leo (and after him Pope John VIII) offered the remission of sins for those Christians who died fighting Islamic invaders. Such was the existential and ongoing danger Muslims, referred to in contemporary sources as “Sons of Satan,” caused for Europe—more than two centuries before the First Crusade was launched in 1095. In order to get rid of them, Pope John VIII decided in 878 to promise them an annual payment [or jizya] of several thousand gold pieces; but this tribute of the Holy See to Islam seems to have been paid for only two years; and from time to time until the beginning of the tenth century, the Muslims reappeared at the mouth of the Tiber or along the coast nearby. Today, many Muslims, not just of the ISIS-variety, continue to boast that Islam will conquer Rome, the only of five apostolic sees never to have been subjugated by jihad (unlike Antioch, Alexandria, Jerusalem, and Constantinople). And that is the point Pope Francis misses: walls should only go down and bridges should only be extended when both parties are willing to live in amicable peace. Otherwise they serve only to make the destructive work of those who have for centuries been trying to subjugate Europe in the name of Islam that much easier. Note: For more on how walls saved Western civilization from Islam, see Ibrahim’s recent book, Sword and Scimitar: Fourteen Centuries of War between Islam and the West.